Governor Schweitzer will be in town tomorrow, 11 a.m to 1 p.m. at the University Theater to discuss the impact of the Smurfit-Stone plant closure. They like to get a count before hand, so try and RSVP to Debbie Evans at debbie@maedc.org. This was announced pretty late, I have to say – a 6 p.m. announcement on Bob Jaffe’s liserve, which was a few hours after Mayor Engen organized a conference call – which included White House representatives and our Senator’s aides – to discuss where to go next for the displaced workers, and where to go next for Missoula. I mean – when other elected officials are saying stuff like this: “I don’t think any of us really has any particulars on how it’s going to play out, but I’d be darned surprised if it didn’t have a pretty major impact on this county,” on the morning of the closure, it sure makes me glad we got people like Engen thinking that we better do something sooner than later. Pick up the phone. Make some calls. Get leaders involved. Like now. ASAP. Via Missoulian reporter Keila Szpaller’s Twitter – looks like Mayor Engen did a partial veto, allowing calls and hands-free, but keeping texting illegal. Council has a week to consider. UPDATE: Engen calls for texting to be a primary offense. I’ll link to the letter when it becomes available. Bob Oaks of the North-Missoula Community Development Corporation (NMCDC) asked me to pass along this good news about NMCDC’s latest perpetually affordable home ownership project, Burns Street Commons, and Wednesday’s visit by Senator Baucus to celebrate the project’s completion. This coming Wednesday, at 3:00 p.m., Missoula Mayor John Engen will join Senator Max Baucus to celebrate the completion of Burns Street Commons. The Commons is a 17-unit housing component of Burns Street Square, the largest publicly funded community revitalization project ever undertaken in this low-income Missoula neighborhood. The ribbon cutting ceremony will begin at 3:00 p.m. and will be followed by an open house of the Burns Street Commons’ homes. Refreshments will be served at both events. The Commons is located at 1400 Burns Street (between Cooley and Turner Streets). Burns Street Square is a project of the North-Missoula Community Development Corporation (NMCDC). Currently, the NMCDC has 17 new townhouse and condominium units for sale. The Burns Street Square development expands the community land trust model to include a commercially oriented community center building. That community center will focus on nutrition and will attempt to democratize fresh, local and whole foods to a wider variety of Missoulians. The fledgling Missoula Community Market is already in the old freight building. The NMCDC plans to remodel it to add a cafe and commercial kitchen. Also last month, a federal appropriations subcommittee recommended that the NMCDC receive $1,000,000 to help with the building’s remodeling expenses. For additional information on Burns Street Square contact the North-Missoula Community Development Corporation at (406) 829-0873 or visit www.nmcdc.org. Mayor John Engen’s essential workforce affordable housing initiative, titled Housing in Missoula: A Community Conversation, will debut in a public meeting to be held this Thursday at City Council Chambers at 140 Pine Street, at 7 p.m.
Notice of the initiative was first discussed at the February 25th city council hearing when the Mayor unveiled a 20 minute video, produced by MCAT. The video is intended to initiate a community-wide conversation on the housing – the rising cost and the impacts it is having on community character, local business, the local economy and, as the video suggested, economic growth. A packet containing local housing data will be available at the meeting. Just in time for this conversation, oddly, the Missoula Organization of Realtors removed its market data and trend information from its website. To be fair, that may have more to do with them trying to maintain the high prices on Missoula housing (that they’ve played a part in) through the Bush-influenced, banking-industry-run-amok recession that we are currently experiencing than any denial of the shortage of essential workforce housing here in Missoula. Some local and regional tidbits that I found interesting. Three of the four items below were gleaned from the daily Missoulian (Tuesday, August 28). Governor Schweitzer has called a special session to deal with the extraordinary fire costs from the summer of 2007 (and it ain’t over yet). This seems like an inefficient way to deal with the state’s firefighting budget. Can’t this be done by emails or phone calls or even snail mail? Or maybe give the governor the power to shift money around in budgetary emergencies like this? (It’s not like the money isn’t there; there was $180 million left over from the last session.) Think of the wasted time and money, and the inconvenience, of getting 100 house members and 50 senators back to Helena for a day. There has to be a better way. Urban chickens are going back to committee for some detailing. City council heard from the public last night but didn’t vote on the new ordinance to allow six hens (no roosters) within the city limits. It sounded like the pro-chicken advocates outnumbered the anti-chicken forces at Monday night’s hearing. 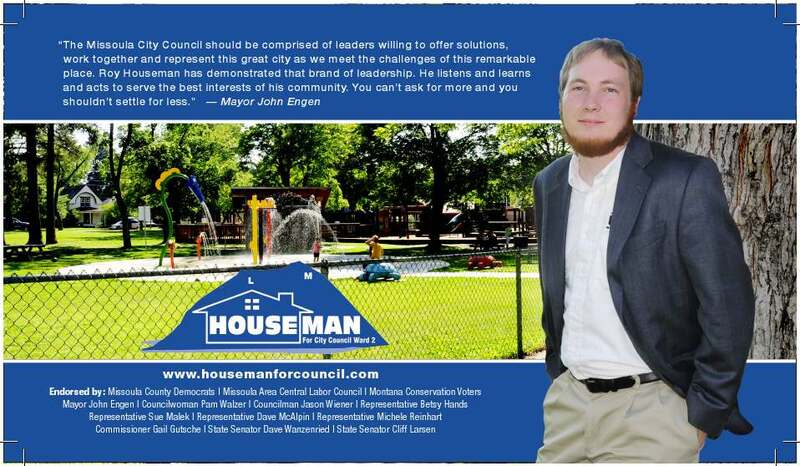 Finally, a small item at the bottom of a display ad for the Missoula Osprey baseball team, and I quote: “FREE Mayor John Engen Bobblehead Doll to the 1st 750 fans through the gates. Sure to be a collectible!” I had no idea these were available. If I can’t make the game, can someone tell me where I can pick one of these up? A bobblehead would sure look sweet in the back window of my car. A shining night for Missoulians – war referendum to go to the voters. In what might be described as an atypical city council meeting for the Garden City, Missoulians from both sides of the Iraqi war discussion filled city council chambers and waited patiently to let their voices be heard on one of the most contentious issues facing all Americans everywhere – continuation of the war in Iraq. I watched from afar (gotta love MCAT), fearing that the whole meeting would deride into chaos, but my ingrained cynicism got the best of me last night. I was wrong. All speakers, including the council members, were civil, articulate, thoughtful, respectful and attentive. No boos or hisses, no one walking out of the meeting, no one getting assaulted in the hallway. Pretty amazing considering not only the history of regular Monday night council meetings, but the topic at hand. I believe the referendum gives Missoulians the opportunity to be heard in a more intimate manner – vote by vote. More importantly, it opens up a forum for discussion on the Iraqi war itself – the validity, the value, the purpose, the cost. I think the coming discussion will make all Missoulians more aware of the war in an every day, every hour, every minute manner – something that is missing in all of the ‘war’ talk. Americans go on their merry ways, while soldiers are shipped daily to a war built on a lie, and bolstered still by even more lies. American soldiers die daily, yet at home, Americans head down to the Walmart to buy their stuff. Soldiers are maimed and brought home without limbs while we fill our tanks with the very stuff that is the real reason why we are over there fighting people who have done us no harm. Saddam is gone, hanged, and yet there is absolutely no end in sight. His own Sunni supporters are in positions of power. The Iraq war is not the Afghanistan war. It is not a war against the terrorists that attacked us on September 11, 2001. A separation needs to be drawn – loud and clear – between Iraq and Afghanistan. Too many blur that line, including the Bush administration. Even today, with all that is know, that line is still blurred. It has to end. I look forward to the discussion to come. War is unpleasant – and people need to be reminded of it every day. We will be living with reminders of the Iraqi war’s unpleasantness for decades to come, as its soldiers return to live the lives they so richly deserve. We can not and should not waive off any discussion of so important a ‘divisive issue’. It brings shame to the heroes who serve this country so proudly. The soldiers and their families who have sacrificed and are sacrificing so much deserve this conversation. All of America should be so lucky. Tucked into Monday nights city council meeting, new Office of Planning & Grants Director Rogar Millar reminded City of Missoula residents that his department would be initiating and update of the city zoning and subdivision regulations with a meeting – including refreshments – at the Broadway Building conference room at St. Patrick’s Hospital on West Broadway. The Town Hall-type meeting starts at 6 p.m., Wednesday, June 27th. The Office of Planning and Grants has this link up for more information. You can also call 258-4657. As Mayor Engen said “This is an important meeting, folks” – and while zoning and subdivision regulation talk might seem dreary and boring, it is the meat-and-bone of how this city is run. It affects your daily life, your quality of life, whether you realize it or not. Participating in this discussion and providing meaningful input into regulations that, once they are in place are usually pretty difficult to change, is a worthy project. Elected officials (and department officials, also) are usually reticent to open up approved regulations for fear of not only opening up a much larger discussion that that of which might be intended, but because it could start a whole train of regulation changes. And besides – just take a guess who is going to be trying to make sure their interests are being covered and protected under the new regulations? Developers and big business. Ward 3’s councilman Bob Jaffe has criticized the city’s budget process in both an email and in an article in the Missoulian. Councilmen Haines, Hendrickson, Wilkins and Ballas have chimed in also in agreement, an odd alliance, really. The gist of Jaffe’s complaint is that the budget is essentially ‘set’ when it gets to them – that the time with which the council has to review and approve it does not allow enough time to exert any influence. “There is no money for lots of stuff I think should get done, but plenty of stuff that seems like it could wait or is a bit extravagant. The standards for belt-tightening is no applied evenly,” Jaffe said. The current budget process is driven by the Mayor and the City Administrator. Department heads meet with the Mayor and City Administrator, beginning as early as April (if not sooner), and they have ongoing discussions with their budget, and then it is essentially handed up to Council for approval. There are lots of meetings. Missoula’s 2006 general fund budget was $36 million. 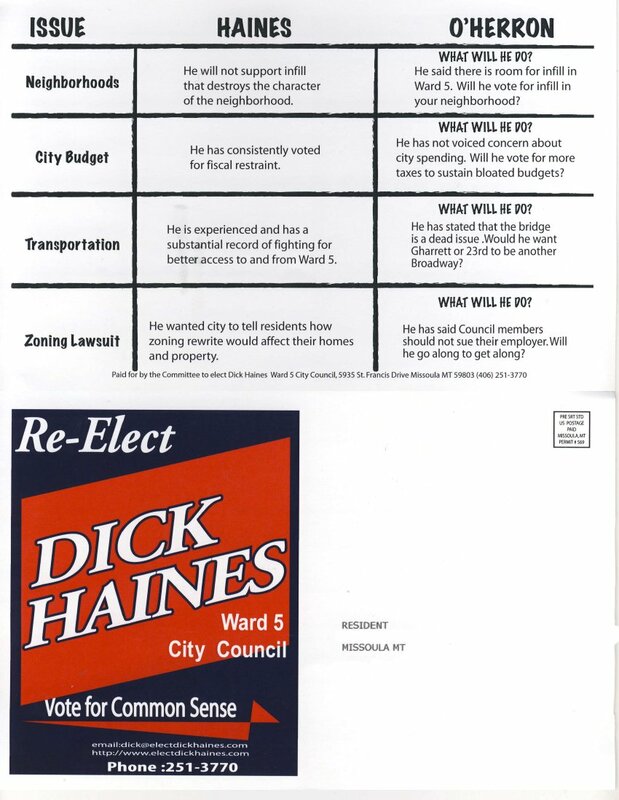 Haines has said that he believes the budget really should reflect the opinions of councilmembers. He’d like to see 10 new pistols budgeted for, in response to a police department request. They currently aren’t there. He’d also like to see a drug diversion officer. I think I understand why, Bob. Maybe the solution is to involve the Committee of the Whole starting sometime in mid-May? Would that be asking too much?